(Volunteer Training Corps) By H H Owtram, April 1934. The Volunteer movement of 1914-1919 appears to have originated spontaneously, mainly from the action taken by ex-officers and members of the old Volunteer Force in forming Miniature Rifle Clubs and later, “Volunteer Training Corps”, entirely self-supporting and not under War Office recognition. In Lancaster in the early days of the War a Volunteer Corps under the title of the Lancaster Volunteer Training Corps was formed by Mr A B S Welch and one at Morecambe with detachments at Silverdale and Caton, organised by Captain J Noar VC, these eventually became the “A” and “B” Companies of the 1st Volunteer Battalion, King’s Own Royal Lancaster Regiment. Similar Corps or detachments were formed at Lytham, St. Annes, Blackpool, Fleetwood and Poulton. “Blackpool and Lancaster” and “Preston” areas, all under the authority of the Lord Lieutenant of the County – at that time the Right Honourable Lord Shuttleworth. Battalions dealt with by the East Lancashire Territorial Association were the 1st, 2nd, 3rd, 4th 9th, 10th, 11th 15th, and 16th and the West Lancashire Territorial Association took over the 5th, 6th, 7th, 8th, 12th, 13th, and 14th Battalions. Colonel Sir James de Hoghton was appointed County Commandant and Major E Bohane, County Adjutant. The North Western group, with which we are primarily concerned, consisting of the 12th, 13th and 14th Battalions, had their headquarters at Preston. Major H H Owtram was appointed Group Commandant with rank of Lieutenant Colonel , Captain G W Lowcock was the group adjutant, but upon his retirement owing to ill health he was succeeded by Captain J W Turner of the 13th Battalion. The 12th Battalion took over the Headquarters of the 88th West Lancashire Field Brigade, Royal Artillery, Territorial Force at Preston; and the Headquarters of the 13th Battalion (afterwards the 1st Volunteer Battalion, King’s Own Royal Lancaster Regiment) were located at the Dallas Road Drill Hill, Lancaster. At Barrow in Furness, the 14th Battalion (afterwards the 2nd Volunteer Battalion, King’s Own Royal Lancaster Regiment) occupied the Territorial Drill Hall. Up to this time (October 1916) Members or Corps had to supply their own uniforms (khaki disallowed) and equipment; a certain number of D P rifles were obtained from the Territorial Force Associations, and all ranks were ordered to wear red armlets bearing the letters “GR” in black. Until the Volunteer Force Order XXXI of 13 January 1917, came into force, all Volunteer Units were entirely self-supporting. The above order provided that men who were eligible for section “A” and who sign the agreement to remain in the Force until the end of the war etc., should, as soon as passed efficient, be provided with uniforms and equipment and that the whole cost of training and equipment would be borne by the Government, also that if called out for active service they would receive pay and allowances corresponding to Territorial Force Rates. As early as July 1916, men temporarily exempted from Military service were being ordered by Tribunals to enrol in section “B” of Volunteer Training Corps, compulsory powers to enforce these orders were given by Military Service (No.2) Act, 1918. Under Army Order 208 of 1918, authorising new alternative titles for units of the Volunteer Force, the 13th (Lancaster) and 14th (Barrow) Battalions Lancashire Volunteer Regiment, became the 1st and 2nd Volunteer Battalions, King’s Own Royal Lancaster Regiment. Under Army Council Instruction 898 Volunteer Force Order No. CSCVI, the Badges of the Affiliated Units of the Territorial Force with the addition of the letter “V” in bronze below the collar badge, were authorised and adopted. Equipment. As previously stated, up to about the end of 1916, units had the responsibility of finding such equipment as it was possible to obtain, for the members of their Corps. When Army Council Instruction 827 of 1917 came, authorising application to Territorial Force Associations for sets of Infantry equipment for all men passed as efficient on the strength of each unit, rapid progress was made. In May and June 1917, rifles of 1914 pattern were issued with instructions to return all DP rifles to Burscough; shortly afterwards Hotchkiss guns were supplied to all units, also entrenching tools, great coats, boots, even iron rations and all equipment required, so that early in the year 1918 all units were prepared for an order at any time for immediate mobilization and to take up their allotted duties. Training. Efficient musketry and Machine gun instructors were supplied from Western Command through the period 1917 to the end of the war, and courses of instruction in these subjects took place daily in the evenings. Saturdays and Sundays afforded opportunities for Musketry and field work, entrenching, etc. Many Officers and NCOs attended courses at Western Command Schools of Instruction in gas and trench warfare, bombing classes, bayonet fighting etc. Local schools of Instruction were also organised where courses could be taken by Officers and NCOs in Map Reading, Musketry, etc. Scheme of Defence. Mobilization Order by General Officer Commanding in Chief, 27 April 1917. One Volunteer Battalion, will be added to each Brigade of Regular Forces of 5 Brigades, other Volunteer Battalions, allotted to General Reserve centres. Under general orders of defence the three units of North West groups were detailed for defence of Railway Line (approximately from Wigan to Westmorland Border). Active Service. The 1st Volunteer Battalion, King’s Own Royal Lancaster Regiment, furnished a company under command of Captain G E Pearch, Lieutenant F Thompson and 2nd Lieutenant J W Turner, for service on the North East Coast from 29th June 1918 to 29th September 1918. The 2nd Volunteer Battalion, King’s Own Royal Lancaster Regiment, also provided a Company for similar active service at the same date. War Office Instruction 99/869 (Adjutant General 1) 25th September 1919 ordered disbandment to be completed not later than 31st October 1919. Report of Public Service Rendered by 1st Volunteer Battalion, King’s Own Royal Lancaster Regiment. 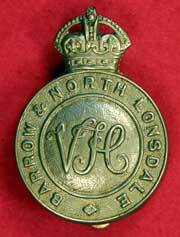 Cap Badge of the Barrow and North Lonsdale Volunteer Training Corps, First World War. War Office letter dated 12 Jan 1920 to Honorary Captain A B S Welch, who was an officer in the Volunteer Force in the 1st Volunteer Battalion, The King’s Own Royal Lancaster Regiment, in the First World War. Letter from Lord Lieutenant to Captain A B S Welch, 1st Volunteer Battalion, The King’s Own Royal Lancaster Regiment dated 17 Oct 1919 relating to the Lancashire Volunteer Corps in the First World War. Certificate to Captain A B S Welch, 13th Battalion, Lancashire Volunteer Regiment, with results of various examinations held in Preston in Mar 1917. Letter to Captain A B S Welch dated 19 Feb 1918 offering a Commission as an officer in the Volunteer Forces. Corps Register Barrow & North Lonsdale Volunteer Training Corps, Headquarters, Drill Hall, Barrow in Furness, December 1914 to March 1915. Certificate of Service, Volunteer Force, to Private John Thomas Ingle, number 954418, of the 2nd Volunteer Battalion, King’s Own Royal Lancaster Regiment. Showing enrolment on 7 Sep 1916 and discharged on 23 Oct 1919. 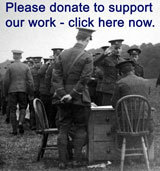 Having entered into an agreement under the Volunteer Act 1916 on 20 Nov 1917.